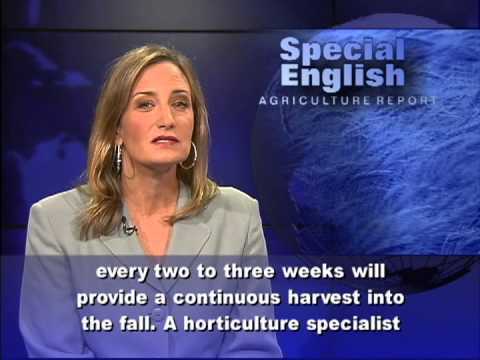 From VOA Learning English, this is the Agriculture Report. There's always work to do in a garden, but some plants need less work than others. Beets are a root vegetable that do not need a lot of care. People might think beets are always dark red. But they can also be pink, yellow or white. Beets are high in nutrients including folate, iron and fiber. They can be used fresh or frozen, canned or pickled. And not just the root but also the tops can be eaten. The leaves make good salads when the plants are young, and the greens can be cooked when the plants are older. Beets like cool temperatures, between 16 and 18 degrees Celsius. They grow best in full sun and in loose soil that is not too wet. Remove stones from the soil while preparing the ground. And test the soil before adding lime and fertilizer. Some experts say the best fertilizers for beets are low in nitrogen. Beet seeds can be planted as soon as the soil is able to be worked at the start of the growing season. Planting them every two to three weeks will provide a continuous harvest into the fall. A horticulture specialist at Iowa State University suggests planting the seeds a little more than one centimeter deep.